These days, kids get different kind of toys. Modern society changed a lot of things. It is not a common thing for a modern parent to just get a tablet for their kid instead of getting a real toy. This is not a bad thing as technology can have educational purposes but children also need to experience classic toys. Technology keeps us connected but it does not teach children how to play. Both girls and boys should get real toys. While buys have more options, all girls should get a doll house toy. They are a classic and odds are, moms had a doll house when they were a child. Doll houses have not disappeared. It is just parents whom choose to spend their money on other things for their child. A classic doll house is usually made out of wood. However, not all of them are made out of wood and they do not have a standard size. There are small, large and huge doll houses and everyone knows that bigger is better. A big doll house can be a lot of fun. It does not need to be made necessarily out of wood but it needs to have inside all the things one would normally have in a real home. The more accessories a doll house has, the more appealing it is for a young girl. Today we will go through 10 different doll houses of various shapes and sizes. Some of them come with a few accessories while others are filled with plenty of things to play with. Without any further ado here is our list of the top 10 best doll house toys in 2019. The Greenleaf Garfield doll house kit is a great pick for parents that want a classic toy. It is made entirely out of wood and it is quite big. The Garfield doll house is the largest model made by the manufacturer. It has two large balconies, two bay windows, easy to access rooms and corner opening with a removable roof section. It allows access to every single room. The house is painted with realistic colors and it has a lot of attention to details. Shingles are not included for this particular model. The doll house is quite expensive. Not all parents might be willing to spend this much. The high price tag is justified by the size of the doll house. Very few other models are as large or have such attention to detail. 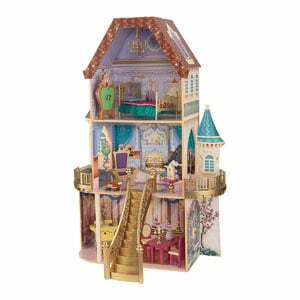 KidKraft Belle Enchanted Dollhouse is a Disney licensed product. It is not very expensive and it is quite large as it is four stories high. The doll house is inspired by Disney’s Beauty and the Beast. All the panels from the rooms as well as the balconies feature artwork from the movie. The house comes with furniture and accessories totaling 13 different pieces. It is a heavy doll house that comes disassembled. The doll house comes disassembled. There are a lot of different small parts that need to be put together and it can take even an hour to assemble the doll house. The instructions are helpful and pieces fit together well but there are just too many parts. The Calico Critter Cozy Cottage is a great little doll house that comes with a modest price tag. It is a simple doll house with two rooms, windows, a door and a removable top floor. 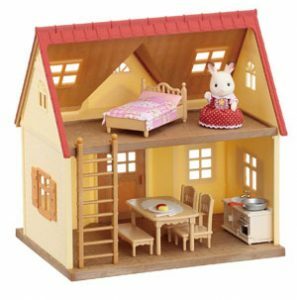 The house includes several accessories such as a table, stove, ladder, a bed and even a small pan. Inside the kit, Calico included also a small door. The house comes fully assembled and with all the mentioned accessories. For safety reasons the doll house is not recommended for children younger than 3 years. While the house includes some accessories, getting extra ones is very expensive. Calico made the house inexpensive but all the extras that can be purchased separately are almost as expensive as the house which does not make a whole lot of sense. Teamson Kids wooden doll house is a very simple model. The doll house is made entirely out of wood including the small furniture it comes with. It is fairly large with 3 floors and five total rooms with wall dividers. The windows cannot be opened but it comes with 13 different pieces of furniture. According to the manufacturers the doll house is recommended for kits of 4 years and up as it has small parts that can be shallowed. The house comes disassembled. This means that a screw driver will be needed along with some patience and free time. The instructions are helpful but the assembly is a bit annoying. Also, the walls are not painted. They are actual stickers that need to be placed carefully when assembling the house. KidKraft Annabelle Dollhouse is a great option for parents that want something large but not too larger. The doll house has five different rooms, an elevator, stairs and a balcony. It is a very colorful doll house that includes 16 different pieces of furniture and a chandelier. The house comes disassembled and with the appropriate instructions. It has great attention to detail and comes with more than enough accessories. Several issues have been mentioned by the ones that already purchased the house. It is an affordable doll house but this should not be an excuse. The stickers placed on the walls tend to peal off and in some cases, small parts might be missing but it is still possible to assemble the doll house. These cases are fairly uncommon but they have happened. Fisher-Price My First Dollhouse playset is exactly what the name states. It is a small inexpensive doll house that is great for a child that never had a toy like this before. Surely enough they will want a bigger one at one point but this one should do just fine for a while. It is mainly made out of plastic and comes with 3 dolls and several pieces of furniture. Most of the parts are easy to remove and putting it together is fairly straight forward. Most doll houses include a few accessories which should be enough for a while. At the same time, additional accessories are usually sold separately. This is not the case with the Fisher-Price. 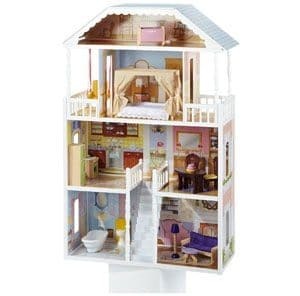 If the child will want additional dolls to go with the house, Fisher-Price does not sell additional pieces of furniture or dolls for the set. 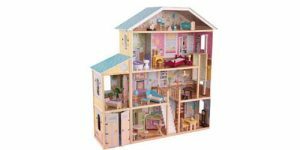 KidKraft Savannah doll house offers great vale for money. It is a large doll house made mostly out of wood and molded plastic with six rooms and open space that allows the child to play freely. The kit includes 13 colorful pieces of furniture and has large, wide windows. There is also a staircase that connects two rooms and a small lamp. The house is about 12 inches tall and fairly lightweight thus it can be moved around easily. For some odd reason, doll houses tend to be difficult to assemble. The KidKraft Savannah is no exception from the rule. It is a large doll house with a lot of small parts and assembling it will take quite some time. Some parts are almost identical which makes it even more difficult to put together. 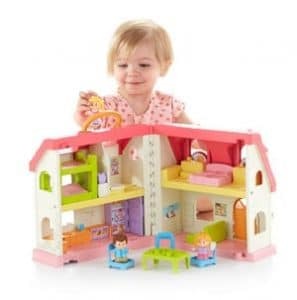 Fisher-Price Little People Surprise & Sounds home is a different type of doll house. It opens up, turning it from a two room house to a four room house. It has also a built-in system that allows the child to touch certain elements in the house in order to hear specific sounds and even songs. The house is made out of plastic with plenty of pieces of furniture and two dolls included in the kit. It is inexpensive and quite big when opened. A handful of people that purchased the house reported that the sounds do not work properly. Changing the batteries does not help. They simply just do not work and will have to be sent back for replacement which can be a hassle and most people might not go through the process. 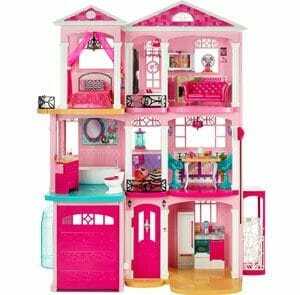 Barbie Dreamhouse is one of the most popular picks. 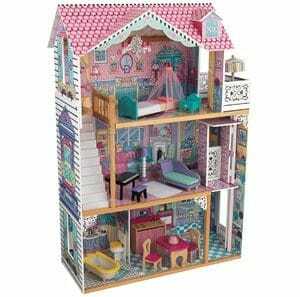 It is one of the most desired doll houses due to how it is made, size, accessories included and the attention to detail. All pieces of furniture are very detailed and all rooms are open and easy to access. 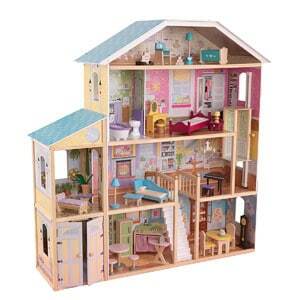 The doll house comes with almost 70 different accessories and it even has a working elevator. It does not include any actual dolls but it has everyone a house would have include a small fan. 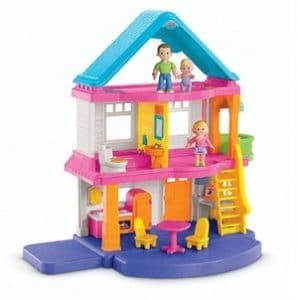 The doll house is quite large making it quite fun for children. If we were to look at how it is made structurally, the doll house is not very stable. It is just fine for most part but it feels as if it is flimsy and fragile. Hitting it with just a tiny amount of force feels as if it could knock it down. 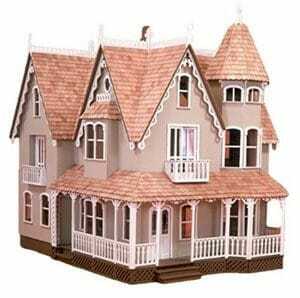 KidKraft Majestic Mansion doll house is one of the largest models in our list. It has plenty of accessories and a lot of rooms. Inside the kit the manufacturers included 34 pieces of furniture and the entire house is divided into 8 different rooms. It even has an elevator and stairs to connect the rooms in the house as well as a small garage. The doll house is made with great attention to detail and has a colorful theme. The bigger the house is the more difficult it is to assemble. 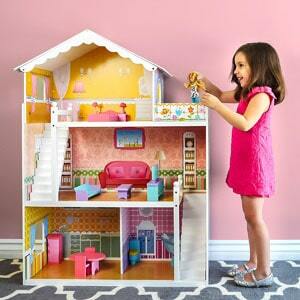 KidKraft majestic Mansion is a great doll house but being so large will make it difficult to put together. It is time consuming and it is not easy at all. The instructions will help a lot. It takes time, patience and a good screw drivers. This is to be expected since most doll houses do not come assembled. Buying a doll house for a child usually starts with setting a budget. Doll houses can be both cheap and expensive depending on the model. Also, since they such big toys it is not a good idea to just buy something random now and later get a bigger house. Here are some things that make each doll house different. Even if two houses may have different sizes, because of how they are scaled, they might have the same number of rooms and accessories. Even if it is obvious, the bigger the house, the more expensive it is. Almost all doll houses need to be assembled. For some models, it is easier while others are a real pain. The easiest ones to assemble are the plastic doll houses which are usually smaller. When speaking of accessories for a doll house we are referring to furniture and appliances. Usually, all doll houses come with accessories. The number of accessories tends to increase with pricing. Also, additional accessories can be purchased separately.